Tony and Jane Robinson believe in forward planning. They stated their narrowboat fund thirty years before buying their own boat. Now the two retired education workers moor in a marina for the winter then explore the waterways during the warmer months. We are both retired, having worked in Libraries & Community Education. 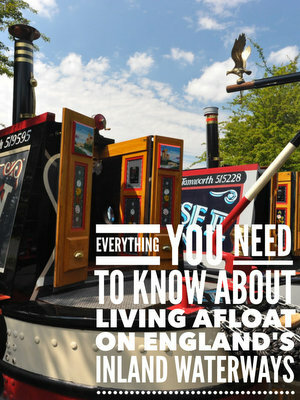 We have been interested in canals since the mid 1970s and regularly hired canal boats for holidays. As soon as we married in 1976 we had the “Boat Fund” – a future amount of money to purchase our own boat. Of course, in reality, the fund never reached 3 figures and we always held on to the belief that one day… Fast forward to 2006 when we were fortunate to have the funds to have our own boat built. Having spent more and more hours afloat on the boat we decided in 2011 to down size – empty our 3 bed roomed house, and move onto the boat permanently. We decided that whilst we are fit & active – lets go for it + most people we met and spoke to who live aboard felt they had never looked back. 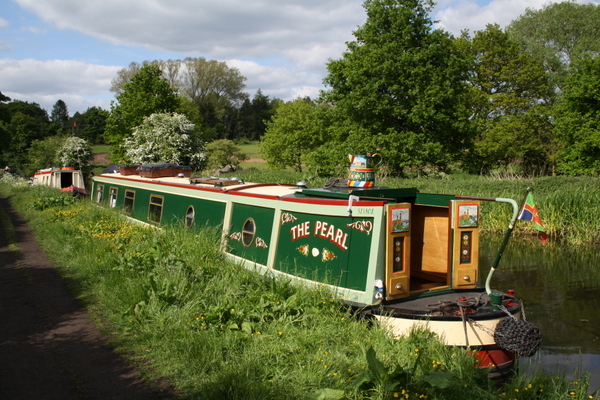 The Pearl – The boat was built and launched following our Pearl wedding anniversary in 2006. Since we had got married in 1976 and always wanted our own boat – the name seemed a perfect confirmation of a future on the water. We moor presently in a large purpose built marina with all facilities and lots of other boaters – a great place to make new friends and share interests in life afloat. However it is not a residential mooring and we have a different postal address. The Pearl is 60’ – we decided we needed an extra 2 feet for living aboard! It is a semi-trad, with large hatch at the back, Beta Marine engine, diesel central heating and a lovely stove! We like to have light, so we decided to have lots of windows + a hatch on the side which is great in the summer. Previous to 2006 we had a share boat for five years. This was the first stage in realising we still loved canals after all those years and gave us ideas of what we wanted & didn’t want on a boat of our own. Don’t sell your house – but rent it out! This is what we have done and so far this has worked well. We are renting to a young family who need the space and love our large garden. The income from the house rent is paid into our “sinking fund” to pay for all the costs of repairs, maintenance, mooring fees, fuel etc. All the time. We stay moored in the marina over winter and then chug off in the spring to explore the waterways throughout the country. Depends what you mean by working! We are presently retired from paid work but do regular voluntary work to keep us occupied during winter. Considering returning to some form of part time work next year to put into the sinking fund!.. Emptying the Elsan – in winter! But it’s a simple process and it just comes to be a routine. Not having space for a large hi-fi system to listen to all my vinyl records. Gales in winter making it a challenge to manoeuvre our boat into a tight mooring space without ramming the neighbours! Being able to untie the ropes and cruise away on our home where we want and when we want. Meeting and getting to know other boaters – we know more people at our moorings than we ever did by living for 25 years in a house! Boaters are mostly a friendly lot. Being out in the fresh air – even in winter. Having a cosy coal fire and listening to the rain and wind hammering outside. We have a good shower but a bath would be great! However- we periodically treat ourselves to a night in a motel to have a good long soak and laugh at the size of the king size beds – usually wider than our boat! We have a fold up bike for the times we are moored away from supplies. We also have a wheeled shopping bag – hauling heavy bags along a towpath is difficult. We have occasionally got a taxi back to the mooring. We have a small washing machine which is good for small washes – usually when we are cruising. We also make use of launderettes when we are out and about – some are very close to canal moorings. If we are moored for a few days we occasionally have a service wash – all washed and ironed! Elsan – Economical – not much to go wrong. We have 3 spare cassettes for when we can’t get to a sanitary stop for a few days. We connect to the marina broadband when we are moored in winter. When we are cruising, we use a dongle on the laptop and this is ok – but the download speeds can be slow and we don’t access music and movie websites. Shropshire Union – lots of interesting things to see, well maintained and the Shropshire Union Canal Society do a fabulous job in providing good overnight moorings. We also like the BCN – ignored by a lots of boaters as not safe – but some really interesting parts to visit and do complete rings in a few days. We have a plug in landline in winter for which we have a pay card. When we are cruising, we use the battery power – but have very low voltage LED lights and an inverter to power the t.v. and laptop. We only use the washer when we are cruising or connected to a land line. Remember – you use more electric in winter than summer – those long long cold dark nights! Great – we have just had a Little Wenlock fitted and it’s excellent – it’s been alight now for about a month and I have mastered keeping the fire going overnight. We also have diesel central heating radiators which are on a timer to come on in the morning and keeps the back cabin warm before going to bed. Speak to as many live aboards as you can – we are mostly a friendly lot. There is no standard boat or typical mooring or typical persons living aboard. Don’t buy a boat and expect it to be a cheap way of living. We have found living on a boat can be expensive in terms of maintenance and upkeep – there’s always a list of repairs and improvements and living on water requires regular maintenance throughout the year. It’s worth hiring a boat in the middle of winter to see how you cope with bad weather. What do you do about Drs and medical matters? I am a type 1 Diabetic and require regular prescriptions. We are both registered at the local GP surgery – but have to call back to the surgery periodically in the summer to restock with supplies. Ensure that you think ahead and plan how you are going to access and pick up any regular medications. Most GP surgeries are understanding, particularly if you need urgent medical treatment whilst cruising – you can register as a temporary patient – but ensure you have your NI No! What do you do about TV? We are now experienced in getting a TV signal in most places we moor. We have an Easyfinder sat dish to get freesat and this is the first task when we moor up at the end of a cruising day i.e finding the satellite signal.! When we can’t get a sat signal we have a small digi aerial and re-scan the t.v to get digital tv. When all this fails – we have a good supply of dvds + there’s also Radio 4!